Do you hide vegetables in meals? If you have children, I’d say that’s a yes. Kids are notorious for refusing dishes that look too obviously healthy/too green. When they are very small, they can still be fooled (“have another of the green French fries!”), but as they grow, the discussion about why veggies are important can become quite a bore. The easy route out of the dilemma is to “healthify” their favourite food. If you chop finely enough, there will be no complaints! I never tire of the moment after the meal when they tell you the food was nice (you do have to ask them for this information, it is rarely offers on its own accord) and you list exactly how many vegetables they have just eaten. Eventually they WILL stop announcing they do not like beans/carrots/*add their most despised vegetable*. Well, maybe this stops at Brussels sprouts. Over the years, I have perfected my Bolognese sauce by adding an insane amount of vegetables from zucchini to red pepper. Zucchini with its mild, unimposing taste is a real chameleon – it works perfectly in any tomato-based dish, but can also be used in baking (watch that space!). Another great candidate for hidden veggie overload are meaty stews. Especially the rich flavour of beef successfully masks the taste of celery, carrots or mushrooms. And in turn, it’s the vegetables that take the broth to the next level. And when you round it off with a veggie dessert such as these pumpkin brownies or some low carb zucchini muffins, you can bask in feeling like a super-mom. 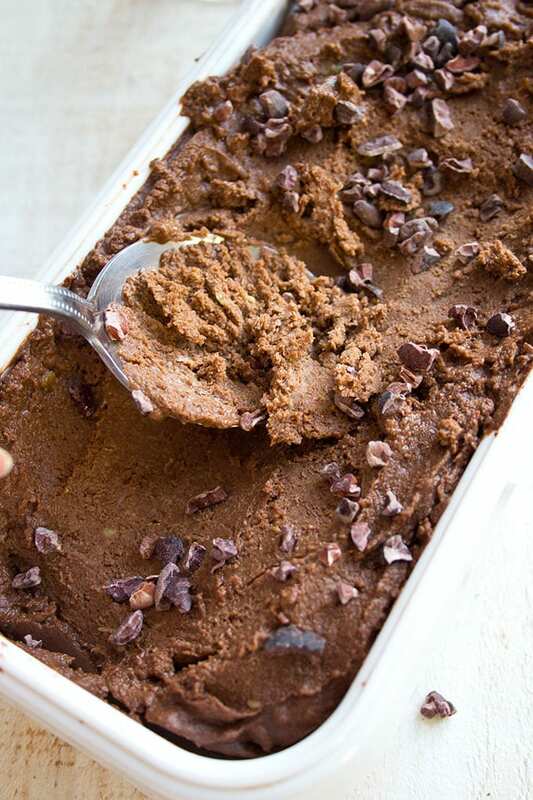 Enter chocolate avocado ice cream. A study has even found that people who eat avocado tend to be healthier. Have I convinced you now? I have posted this chocolate avocado mousse already, which is a ridiculously easy dessert. Avocado and chocolate work just so well together. Combined they are rich and indulgent, yet with a pleasingly fresh note. 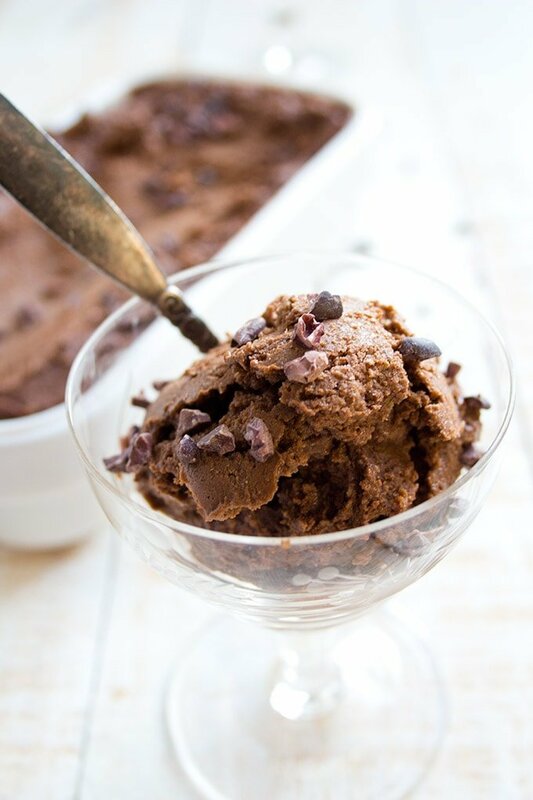 Chocolate avocado ice cream seemed the next natural step, even though it’s February. Or maybe because it’s February. Don’t we all need something to look forward to? 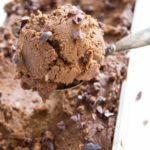 I don’t have an ice-cream maker – if you do, you can still use this recipe and probably get an impossibly silky result. But it works just as well without. All you need is a little more planning and patience. Enjoy! How much is a serving on this? I am lowcarb/keto and don’t want to mess up my macros. But would love to have something icecream like! Adding salt really elevated this for me. For people who have said it is too hard, if you let it sit a little to thaw perhaps 10 mins and then put frozen chunks into your food processor, it will make an amazing soft serve. I used to do that with frozen bananas and frozen fruit to make ice cream. It’s awesome. It will make a lot of noise in your food processor for the first 30 seconds LOL, but it will smooth out into a super frozen treat. Thanks for the tip Jennifer – much appreciated! I also live in Canada and can never find “heavy” cream anywhere lol. The closest I have been able to find is 35% whipping cream. I just bought some specifically so that I can try out this recipe! Hope it works! I used heavy coconut cream instead of double cream and swerve granulated sweetener instead of powdered erythritol. OMG YUM! 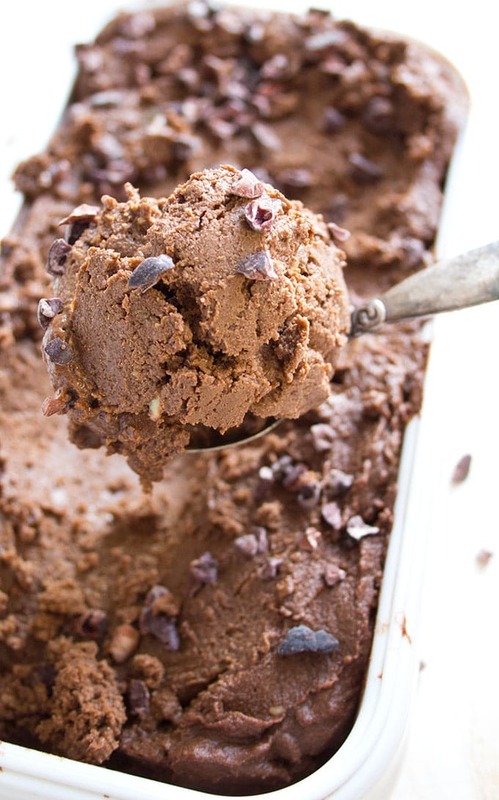 It takes longer than 20 min to thaw, so I eat it at refrigerated temp like pudding….OMG YUM! Did I say that already lol? OMG yes! I bet it’s great with coconut cream. Glad you like it!!!!! Has anyone used honey, stevia, or a combination of the two to sweeten it instead of the erythritol? avocados, which are very creamy. It’s best eaten soon after you make it. I also used sugar free chocolate chips instead of cocoa nibs. Using chocolate chips sounds delicious. Which brand do you use? Made it, sadly guys I think I will stick to the odd tub of Tesco’s finest chocolate ice cream. This was watery to my taste. Thanks for the recipe though, I’m certain people who are not die-hard chocoholics will love it. Hello Helen, I’m sorry to hear this one was not for you. Because it’s a no churn ice cream and because it does not have any additives, it does need to left to defrost to just the right temperature after it’s been in the freezer for a while. Adding a bit of vodka to my low carb frozen desserts helps to keep them a bit softer. I haven’t tried this recipe yet but it sure looks tasty! I will try it as soon as my avocados ripen. Thank you for your time and sharing your recipe. Thanks for your tip 🙂 Let me know how you like the recipe once you’ve tried it! I absolutely love this recipe! I can’t thank you enough! I added a tablespoon of vodka and gave it a good stir every 45 min or so ( since I was home, figured I may as well). My dinner….um…I mean my ice cream came out rich, creamy, and delicious! Hi Rebekah, all cream would work well too, I’m sure. How many servings in a batch? Hello Kim, each batch has 8 servings. This is a gorgeous and genius recipe! I love it! I do hide vegetables for my kids as well, but on the whole they eat vegetables quite well. I have to admit I totally hide vegetables in my own food because I’m terrible for eating them. I would never have thought of this though! Hope you’ll give this a go Kitty! This is brilliant! So creamy and chocolaty that i want to dive right in! I still have yet to use avocado in a dessert, so I think it’s time to try it. Avacado is actually a fruit. LOL, technically you are right. To be exact, it is actually a berry. This is SO sneaky! My son loves ice cream but is in that classic “nothing green” phase. This is perfect! Avocado ice cream is one of my faves – so silky and creamy. I’m lucky that my kids like vegetables and eat them, but it wasn’t always the case. I, too, had to hide them. Great post! Glad you like it, Kim. Always looking for new ways to hide veggies! Can’t wait to try this! It is such an easy recipe, Maya. Hope you’ll give it a go! Thank you so much. Do let me know if you try it out! This is beautiful! I had some avocado chocolate pudding awhile back, and it was still a teeny bit green, and it just wasn’t doing it for me. I love that this LOOKS like chocolate! I’m sure it’s delicious! I love to hide veggies in recipes as well! Looks like a delicious ice cream! I wonder if I can make this Vegan and substitute the cream with coconut cream? Do you think that’d work? I am absolutely sure it would be just as nice. You had me at chocolate ice cream! I love this recipe! I feel fortunate because I’ve never had to hide my vegetables in anything — I put the kale right out there — and my family eats it. I’ve never tried avocado in ice cream before — I know it mimics a creamy smooth texture – might have to give it a shot. You are one lucky mummy, Lisa. Saying that, my daughter likes crispy kale as well. And chocolate avo ice cream..
Hi, how many servings does this make? And how many grams weigh of cubes avocado?? Recipe look awesome but I only need to make 2 servings and this might make 6 or 8, I don’t know! This ice cream is filling. I’d just halve the recipe and use 1 avocado. Eat as much as you’d like and keep the rest for another time. Always good to have a backup dessert in the freezer!